Arsenal beat Newcastle United 2-0 at the Emirates Stadium on Monday to end the 26th round of Premier League games in 3rd position. Aaron Ramsey and Alexandre Lacazette scored for the Gunners but it was Mesut Ozil who stole the limelight after being awarded the Sky Sports’ Man of the Match award for his performance. Ozil has repaid head coach Unai Emery’s new found trust in him for a series of impressive displays. 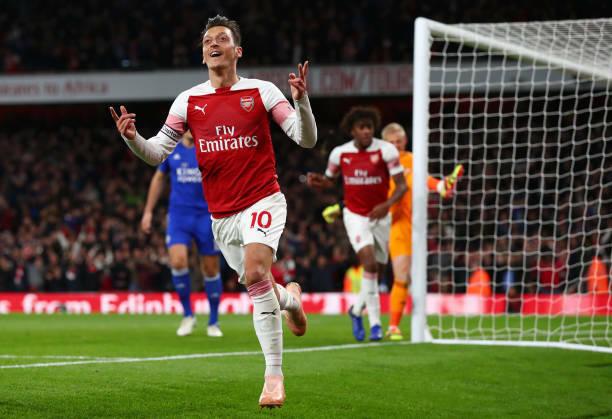 The Gunners have won four and drawn one of their last five games in the league which has coincided with Ozil winning his place back in the side after struggling for playing time early on in 2019. The victory was the Gunners 10th home league victory in a row according to the BBC – their best run of form since December 1997 to May 1998. The latest result saw bookmakers shorten the odds on a top-four finish for the North London based outfit. Despite holding a slim two-point cushion on 3rd-place (and the final Champions League spot) in the Premier League with seven matches to play, SBD say Arsenal are sizable 4/7 favorites to stave off 5th-place Man United (5/4) and 6th-placed Chelsea (7/4). Even with Danny Welbeck sidelined and their defensive issues, they are poised to make a big improvement on last year’s 63-point performance. The Gunners are already on 60 points with 21 still available and matches against, Brighton, Burnley and Palace still to play. Emery’s star players including Ozil, Ramsey, Lacazette and Pierre-Emerick Aubameyang have all hit form at the right time and could be key if the Gunners are to hold onto a top-four spot. Ozil picked up his first Man of the Match display of 2019 against Newcastle United. The playmaker of Turkish origin has five goals and three assists in 25 appearances for Arsenal this season. The Gunners take on Everton next at Goodison Park on Sunday 7 April.